Who The Hell Abandons A Porsche 911 GT2 RS? With 612 horsepower and rear wheel drive, you think anyone lucky enough to own a Porsche GT2 RS would drive it every chance they had. 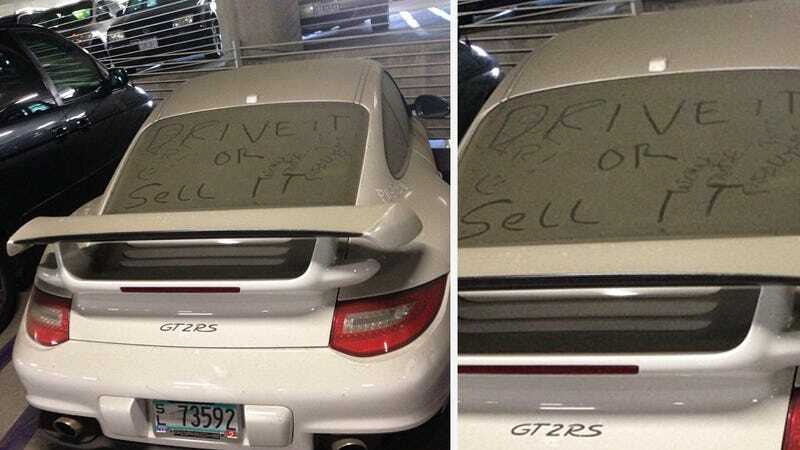 This particular GT2 RS is collecting dust in a parking garage. Why? The picture was sent to us by Futrell Autowerks. They know the location of the car and the identity of the owner, but I do not. All I know is that the car has Oregon license plates, and the owner is a 911 convertible-driving vice president, according to Futrell. I don’t want say where the car is parked for its safety sake, but its been there for quite some time, the owner (a VP where I wont tell you the car is parked) drives his turbo 997 convertible most of the time, the GT2 RS has consistently been parked since last July…. Unlike the abandoned Dubai Ferrari Enzo, I'm not sure I even want to know who owns this car. I'm not even sure I want to know why he's left it to sit for months. I just want to know if he'd like to let me warm up the fluids every weekend or two.